Travis DeVault has more than a passing interest in what investigators find in the engines of the US Airways plane that recently landed on the Hudson River after apparently striking large birds and losing both of its engines. "It is very important to get IDs on species that are struck," he said. "If we don't know which birds are struck then we don't know how to prevent it." The Indiana State University graduate (bachelor's in 1996 and master's in 1999) now works as the field station and project leader at the National Wildlife Research Center in Sandusky, Ohio. The center's goal is to decrease the number of bird strikes by airplanes. "I don't think that we'll totally eliminate bird strikes," he said. "The goal though is to reduce that frequency as much as we can." Since 1990 about 82,000 wildlife strikes have been reported to the Federal Aviation Administration, and DeVault said the number of strikes grows steadily grow each year. In 1997, 3,458 strikes were reported while in 2007 that number had risen to 7,666. "We estimate that only 20 percent of all wildlife strikes are reported to the FAA," he said. About 4 percent of the reported strikes result in substantial damage to the aircrafts. "Over the past 20 years worldwide, 182 people have died and 185 aircraft have been destroyed as a result of wildlife collisions with aircraft," he said. In the United States, wildlife strikes result in more than 550,000 hours of aircraft down time and costs civil aviation more than $625 million every year. Costs to the US military are estimated at more than $100 million each year. Increasing population sizes in the larger birds along with increased air traffic have led to the increased collisions between birds and planes. DeVault also pointed out there is another factor in the strike increases. "Modern planes are faster and quieter than they were decades ago, and thus birds have less time to avoid being struck once they detect the approaching aircraft," he said. Steven Lima, ISU biology professor, said DeVault's research should show ways to save lives and property. "To me, DeVault's research is interesting because it has both a basic research component (in animal behavior) and an important application to a currently serious problem," he said. While birds account for 97 percent of airline strikes, DeVault said the remainder are attributed to large mammals such as deer and coyotes or reptiles such as alligators. More than 700 deer collisions with airplanes were reported in the United States from 1990 through 2006. Of the birds hit by airplanes, 20 percent are gulls, while doves or pigeons make up 14 percent, raptors 13 percent and waterfowl 9 percent. "Usually the heaviest birds are considered the most hazardous, including geese, ducks, vultures and pelicans," he said. "However, small, flocking birds like starlings and blackbirds also can be hazardous to aircraft." To combat the problem, DeVault said airports must use an integrated approach with habitat modification such as fencing or maintaining a consistent grass height as well using noisemakers and other scare devices. Lethal forms of management also might need to be used if other methods do not work. In Ohio, DeVault along with other research biologists and field technicians try to develop methods to reduce strikes. The work includes testing turf grasses to see which ones are preferred by wildlife, studying storm water management techniques that could reduce use by waterfowl and other wildlife, using satellite technology to study the movement of large birds and finding ways to prevent earthworms from moving onto runways where gulls settle to snack. "It's really a multi-faceted problem," he said. "It takes a diverse team to do research on the project." It is that very diversity that DeVault enjoys, as well as the tangible results of his research on daily life. "There's always something different to research with the problem. You never know what you will do next," he said. DeVault, who grew up in Martinsville, entered Indiana State as pre-medicine major and intended to become a doctor. "I've always been interested in wildlife, particularly birds," he said. "Even so, I really never considered wildlife research as a career until several really good professors at ISU - particularly Steve Lima, Peter Scott, Marion Jackson and John Whitaker - turned me on to the possibility while I was getting my bachelor's degree in life sciences." 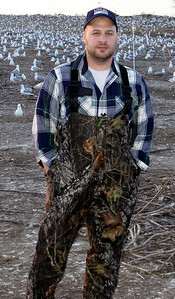 Classes in wildlife management and ornithology in particular opened his eyes to the possibilities and he decided to continue his college work. 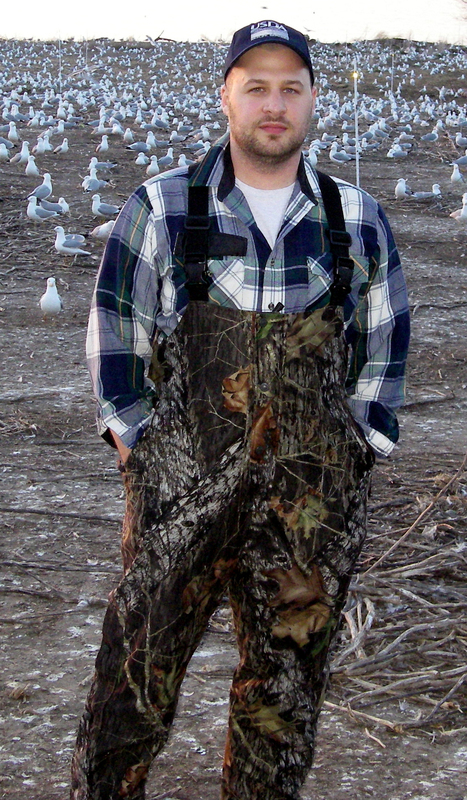 While earning his master's degree in ecology and systematics at ISU, he studied the grassland bird communities in reclaimed surface coal mines in southwestern Indiana. "Travis was a very insightful and hard-working graduate student during his years at ISU," Lima said. "He was the sort of student who makes collaborative scientific research both productive and a great pleasure." As DeVault worked toward his doctorate in wildlife ecology at Purdue University, he studied flight behavior and movement patterns of vultures in South Carolina. "It was information needed to help aircraft avoid the large, soaring birds," he said. He also became interested in helping small, general aviation airports as he conducted research at them. "That helped solidify my interest," he said. "Every airport, every region, has a unique set of problems. One wildlife management plan doesn't work for every airport. I look at our job as developing a suite of different methods that can work in your individual situation." When DeVault learns what exactly caused the US Airways plane to go down, that information will go into the databank of information. "We've been doing some research on wildlife threats in the New York City area," he said. "It will certainly be interesting to see what we can see." Cutline: Travis DeVault while doing field research on ring-billed gulls on an island in Lake Champlain, Vermont. Courtesy photo. Cutline: Travis DeVault holds a double-crested cormorant after attaching a satellite transmitter for research in central New York. Courtesy photo. An Indiana State University graduate from central Indiana has more than a passing interest in the recent US Airways emergency landing in the Hudson River after the plane apparently struck large birds and lost both of its engines. 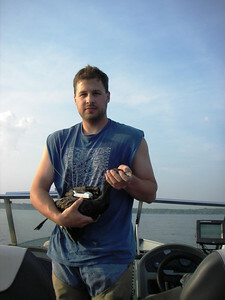 Travis DeVault(bachelor's in 1996 and master's in 1999) now works as the field station and project leader at the National Wildlife Research Center in Sandusky, Ohio.